Request your free consultation at one of our nationwide salons. Absolutely no obligation to buy anything! 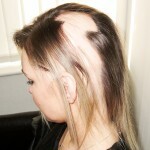 We understand how distressing it can be for women who lose their hair because of alopecia. In fact, alopecia areata is one of the most common conditions we see among women booking a consultation with us. Alopecia is a particularly stressful condition as the cause is often unknown, and although hair can grow back the signs of alopecia often reoccur. The Enhancer System is exclusive to Hair Solved and uses a light flexible mesh applied to the scalp and 100% real hair extensions to create the look and feel of natural hair. What’s more it is an effective alopecia treatment whether your hair loss occurs in small patches or you have total hair loss. It is a natural, non-surgical alopecia solution and will not damage any remaining hair or prevent hair growing back; this is why so many of our clients tell us the Enhancer System is the perfect treatment for their alopecia. Complete the form and we will contact you to arrange a discreet and free consultation with one of our highly trained hair loss professionals in our Belfast Studio. Call our studio direct on 02890 683005, or our freephone number 08000 654501 for general enquiries and bookings. Please quote ref HS3. Is the enhancer system suitable for all types of alopecia? Our bespoke female hair loss solution is suitable for all types of alopecia. The customised mesh of the Enhancer System is attached by threading strands of your own hair through the mesh, which means it is secure and comfortable. If you have complete hair loss we use a specialist surgical tape to attach the mesh and then apply the 100% real hair extensions to the mesh, again ensuring it is secure and comfortable. Can I visit for a consultation before deciding to go ahead? The consultation is such an important part of the process. We will discuss your condition, what you want from the system and explain the fitting and maintenance processes. You can ask our experienced consultant any questions and even talk to an existing client to get the reassurance you need. How is the system different from a wig? Unlike a wig or hairpiece, you don’t ‘take it off’ at night, or before you get in the shower or go swimming. You can’t remove it yourself. You can treat your hair system as you would your normal hair – you can wear it up, down or style it for a special occasion. Can I have it cut and coloured to suit my own personal style? Being able to treat the Enhancer System like your own hair is one of the most important benefits of our bespoke hair loss solution. It is important to us that it reflects your own individual style. At your consultation we will discuss the look you want to achieve. If you are not sure, then our experienced team can advise what might work best for you. You can choose the colour to match your own hair, have highlights or low lights or change the colour of your hair completely.